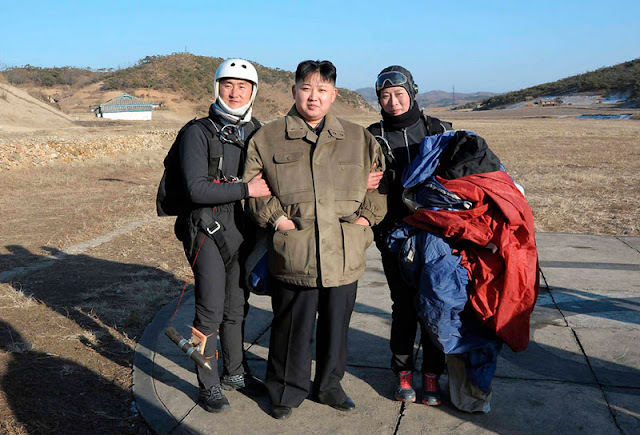 North Korean leader Kim Jong Un (center) watches flight training as he visits Unit 1017 of the Korean People's Army Air Force in an undisclosed location in this undated recent picture released by the North's KCNA in Pyongyang, on January 31, 2012. In his public debut on September 30, 2010, Kim Jong Un (8th from left, front row), the youngest son of North Korea's leader Kim Jong Il (center), poses with the newly elected members of the central leadership body of the Workers' Party of Korea at the plaza of the Kumsusan Memorial Palace in Pyongyang. 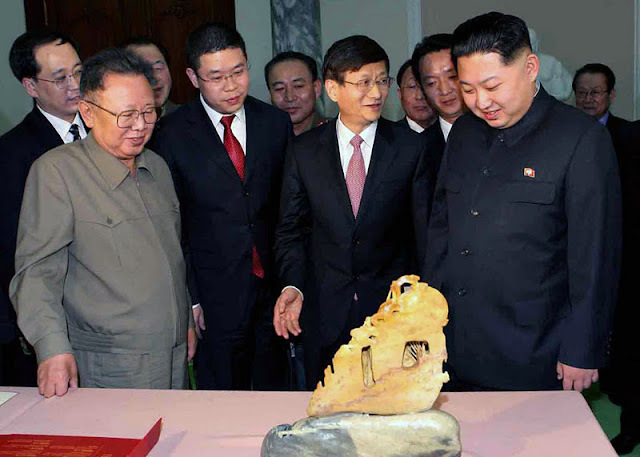 In February of 2011, North Korean leader Kim Jong Il (left) and his son Kim Jong Un (right) look at the gifts brought by visiting Chinese Minister of Public Security Meng Jianzhu (center) in Pyongyang, North Korea. 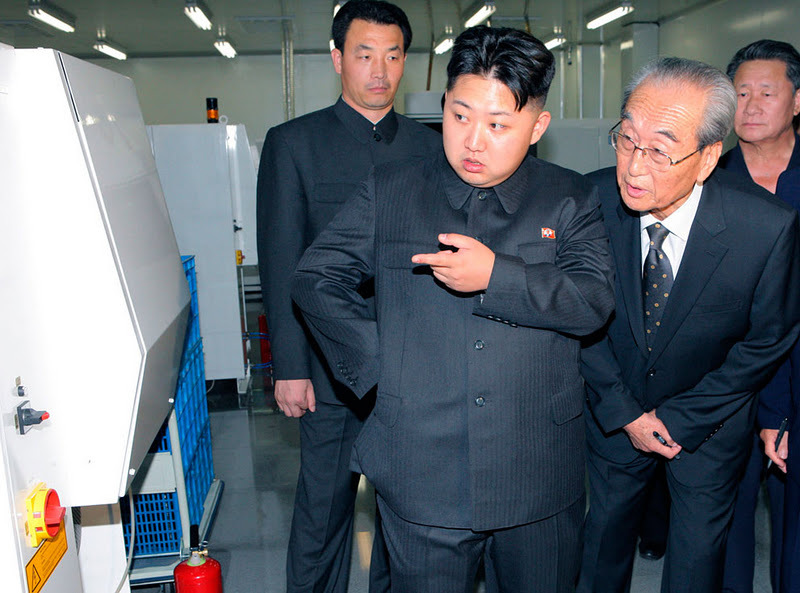 Kim Jong Un visits Mokran Video Company in Pyongyang in this undated picture released by the North's official KCNA news agency on September 11, 2011. 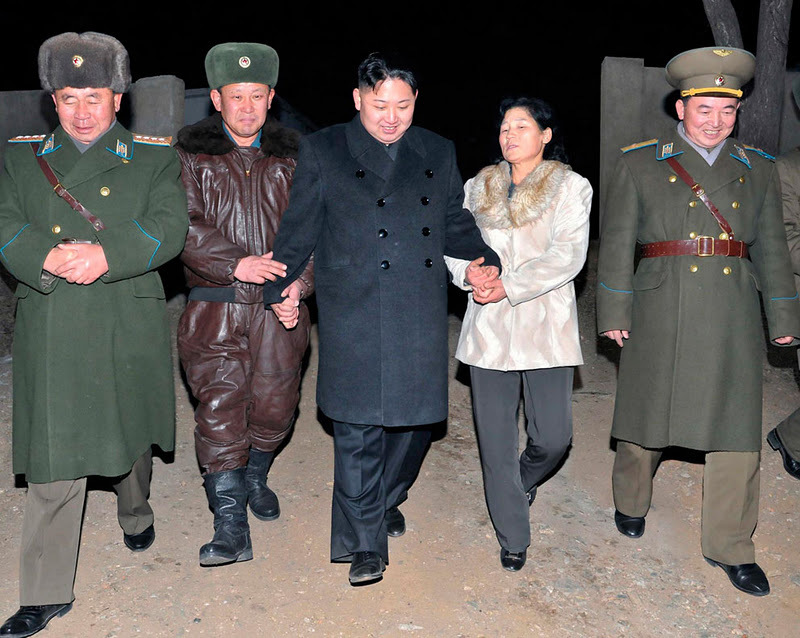 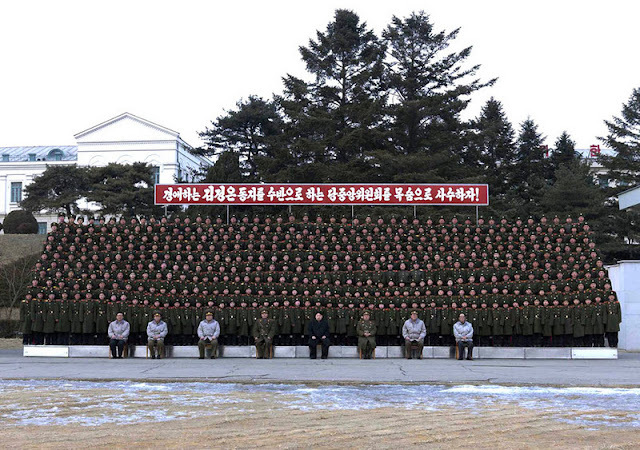 KCNA did not state precisely when the picture was taken. 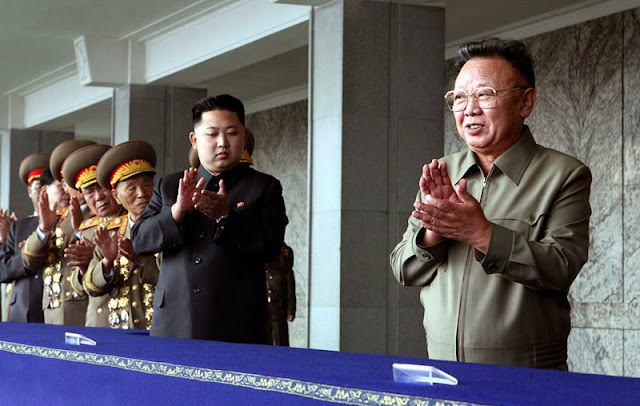 On October 10, 2010, two months before his death, North Korean leader Kim Jong Il and his son Kim Jong Un applaud before a massive military parade celebrating the 65th anniversary of the communist nation's Workers' Party, in Pyongyang, North Korea. 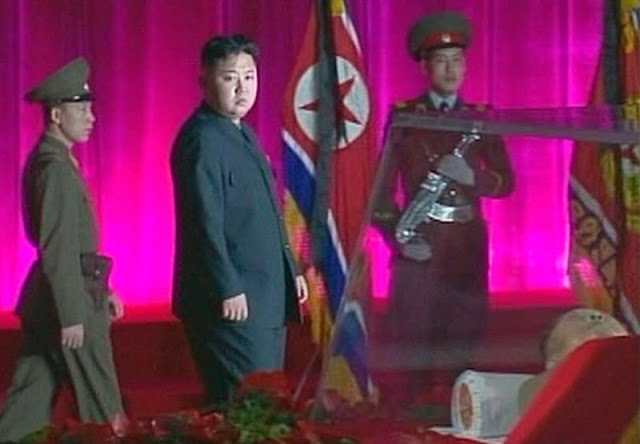 New North Korean ruler Kim Jong Un pays his respects to his father and former leader Kim Jong-il (lower right) who is lying in state at the Kumsusan Memorial Palace in Pyongyang in this still picture taken from video footage aired by KRT (Korean Central TV of the North) on December 20, 2011. 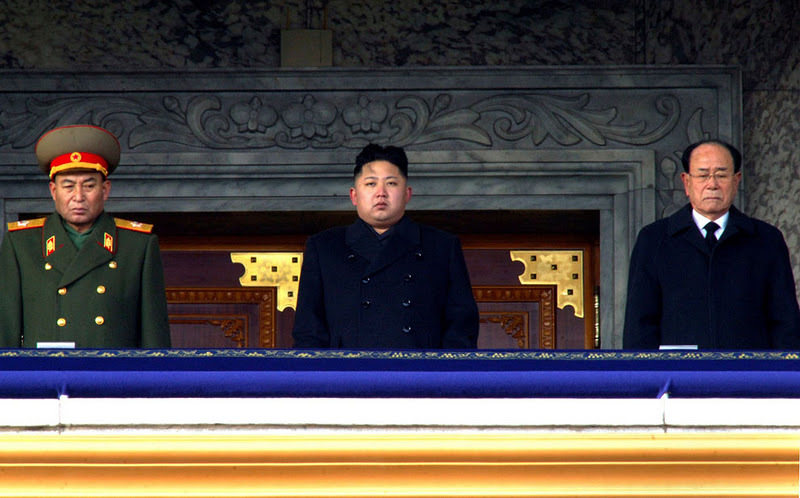 North Korean leader Kim Jong Un presides over a national memorial service for his late father Kim Jong Il at Kim Il Sung Square in Pyongyang, North Korea, on December 29, 2011. Flanking him are Kim Yong Nam, president of the Presidium of the Supreme People's Assembly, and the ceremonial head of state, right, and Ri Yong Ho, a vice marshal of the Korean People's Army. 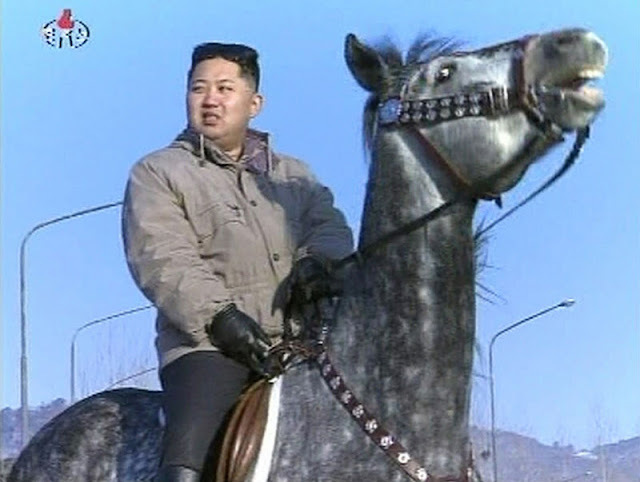 Kim Jong Un rides a horse in this undated still image taken from video at an unknown location released by North Korean state TV KRT on January 8, 2012. 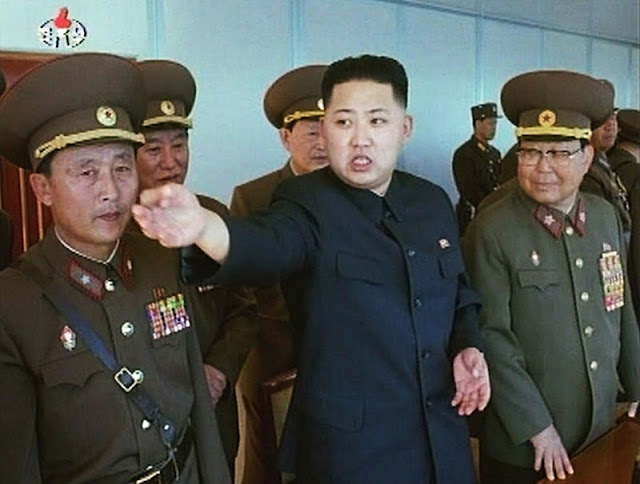 North Korea's state television broadcast a new documentary of its supreme commander Kim Jong Un on his birthday, seen as an effort to idolize the young and untested leader. Kim Jong Un speaks while surrounded by soldiers in this undated still image taken from video at an unknown location in North Korea released by North Korean state TV KRT on January 8, 2012. 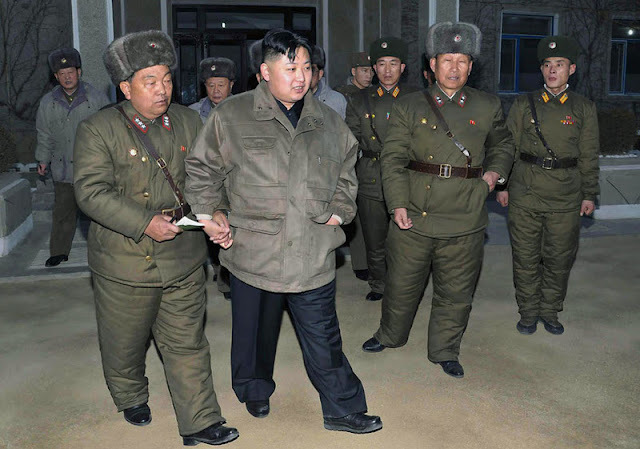 North Korean leader Kim Jong Un visits a facility of the Command of Large Combined Unit 671 of the Korean People's Army at an undisclosed location in this undated picture released by the North's KCNA in Pyongyang, on January 22, 2012. On a visit to the Mangyongdae Revolutionary School during the Lunar New Year holidays, North Korean leader Kim Jong Un provides on-the-spot guidance in this undated picture released by the North's KCNA on January 25, 2012. Kim Jong Un, supreme commander of the Korean People's Army (KPA) and supreme leader of the Workers' Party of Korea, state and army, visits the KPA Unit 169 in this January 19, 2012 photo. 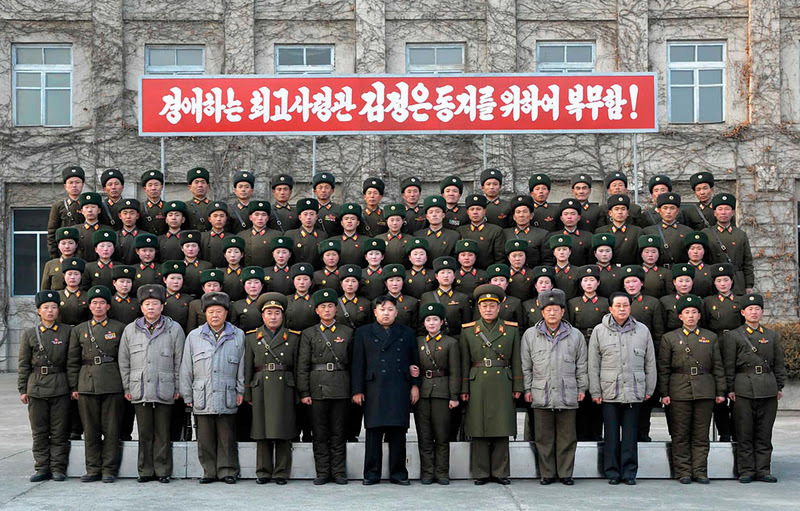 This picture taken by North Korea's official Korean Central News Agency on January 23, 2012 shows North Korean leader Kim Jong Un (center, seated) posing with students and teachers at the Mangyongdae Revolutionary School in Pyongyang for the celebration of the lunar New Year. Kim Jong Un visits the Seoul Ryu Kyong Su 105 Guards Tank Division of the Korean People's Army (KPA) in Pyongyang, in this picture released by KCNA January 1, 2012. North Korea called on its people to rally behind new leader Kim Jong Un and protect him as "human shields" while working to solve the "burning issue" of food shortages by upholding the policies of his late father, Kim Jong-il. North Korean leader Kim Jong Un visits Unit 1017 of the Korean People's Army Air Force in an undisclosed location in this undated recent picture released by the North's KCNA in Pyongyang, on January 31, 2012. 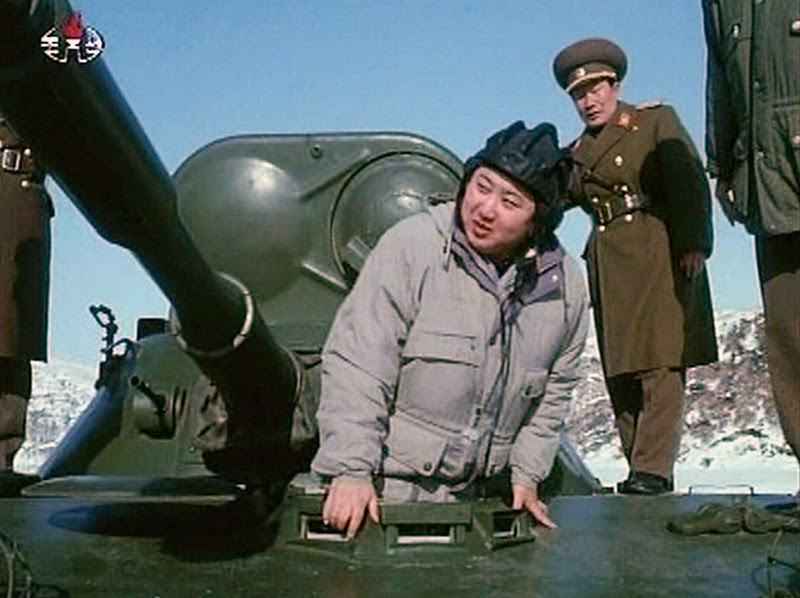 Kim Jong Un inspects an armored vehicle in this undated still image taken from video at an unknown location in North Korea released by North Korean state TV KRT on January 8, 2012. 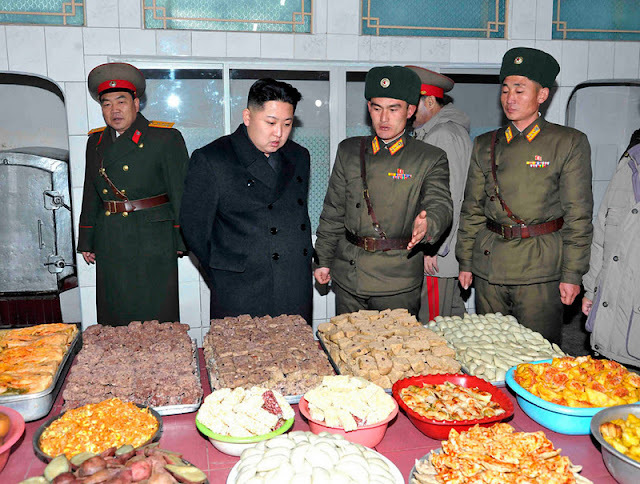 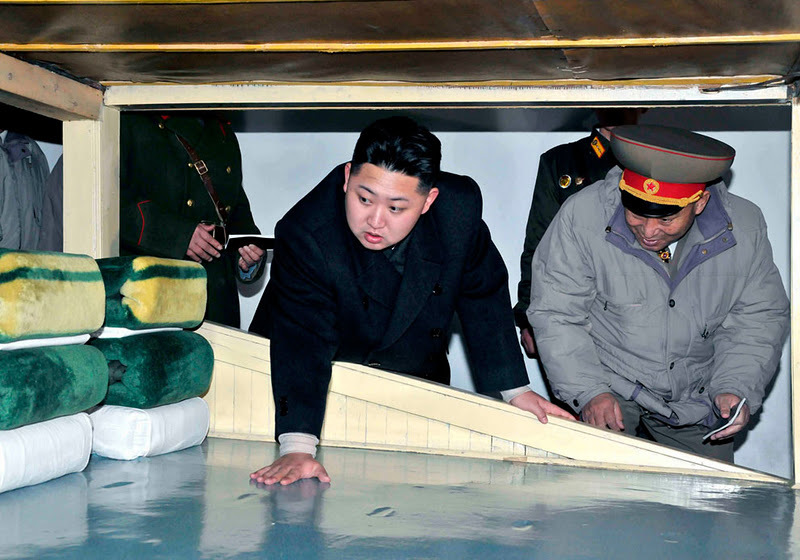 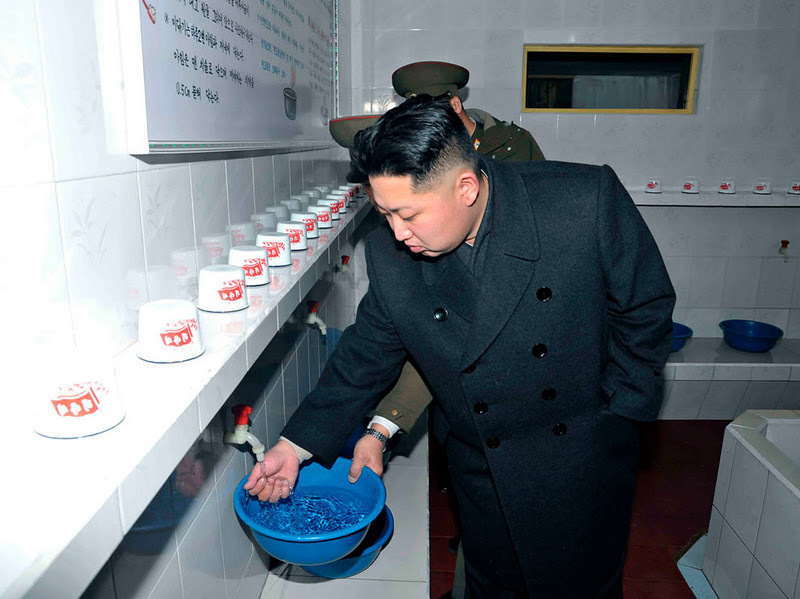 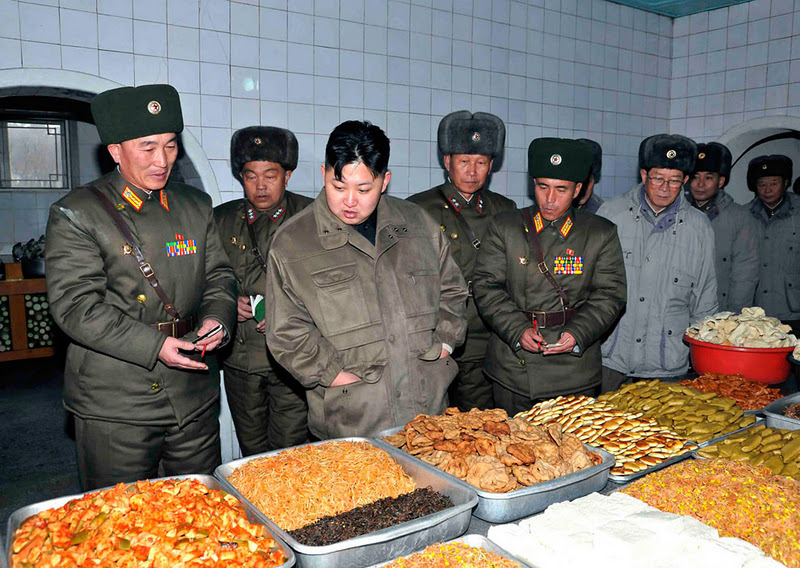 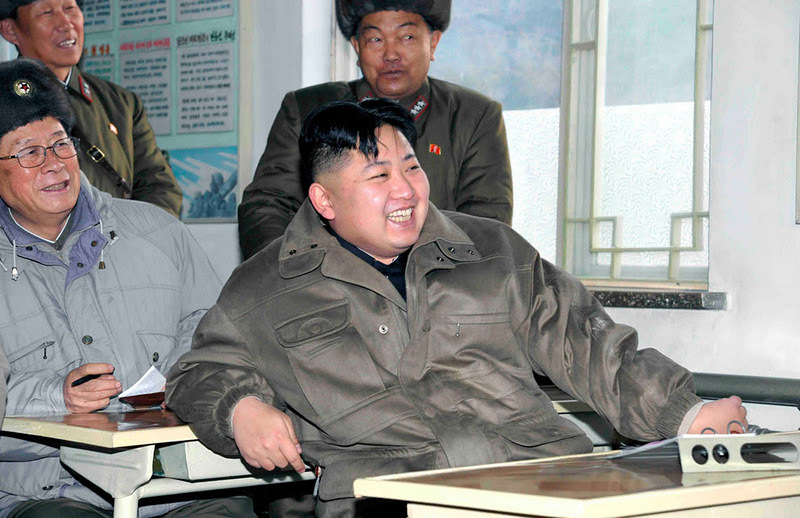 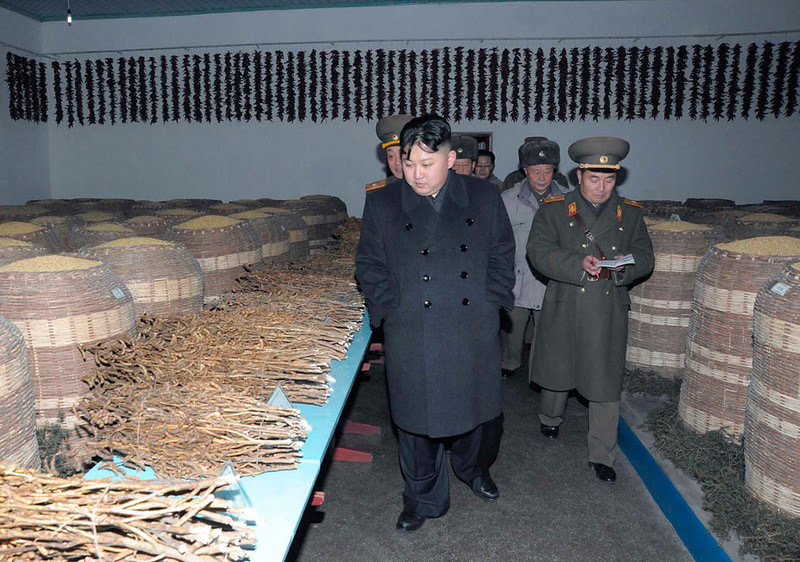 Kim Jong Un is shown a large spread of food while on a visit to the KPA Unit 169 in Pyongyang, on January 19, 2012. 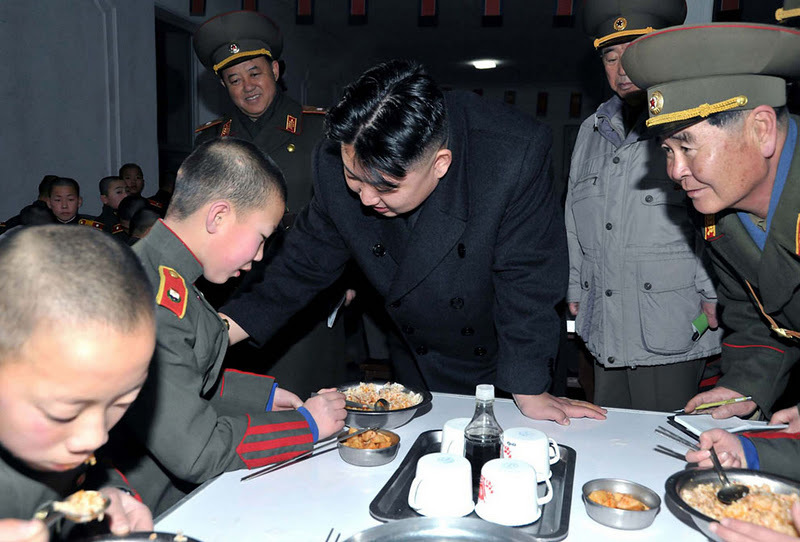 This picture taken by North Korea's official Korean Central News Agency on January 23, 2012 shows North Korean leader Kim Jong Un visiting with students at the Mangyongdae Revolutionary School in Pyongyang. 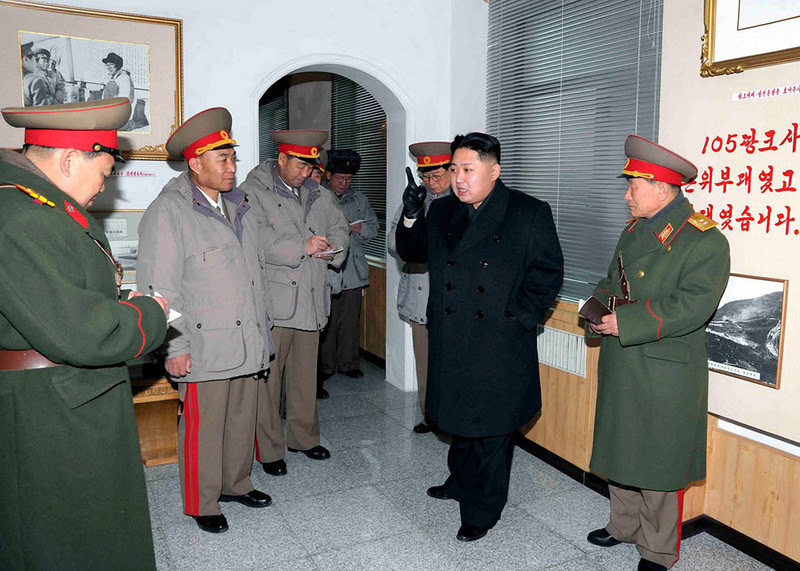 Surrounded by military officials, Kim Jong Un visits the KPA Unit 169 in this picture released by North Korea's KCNA in Pyongyang, on January 19, 2012. 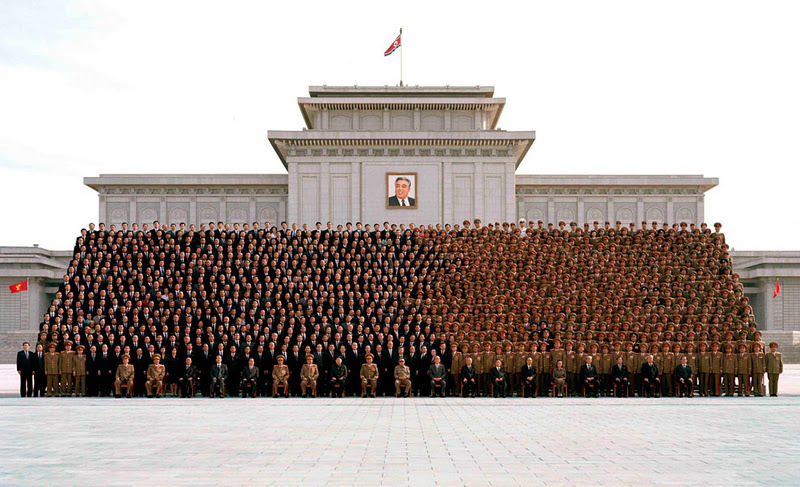 North Korean leader Kim Jong Un (front center) poses during a visit to the Command of Large Combined Unit 671 of the Korean People's Army at an undisclosed location in this undated picture released on January 22, 2012. The sign reads: "We serve for the respectable supreme commander Kim Jong Un comrade!". 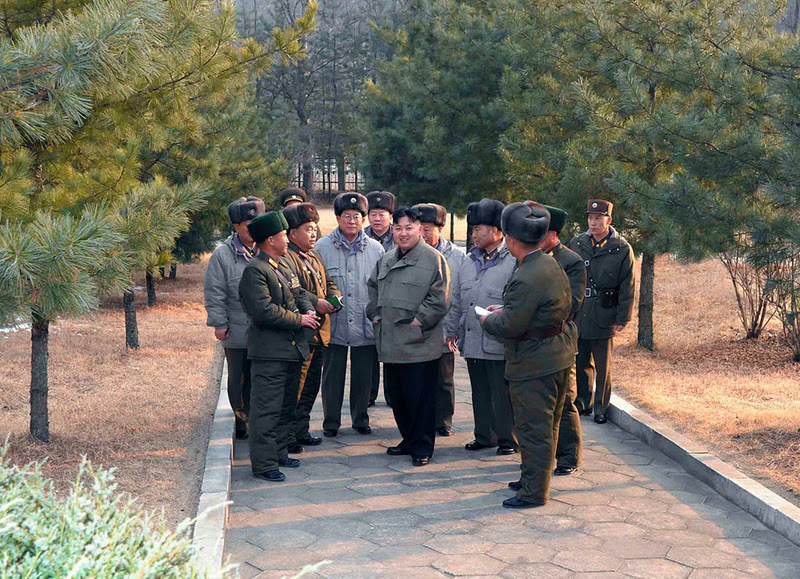 Closely escorted, North Korean leader Kim Jong Un visits the Command of Large Combined Unit 671 of the Korean People's Army in this undated picture released by the North's KCNA in Pyongyang, on January 22, 2012. Kim Jong Un holds a weapon in this undated still image taken from video at an unknown location in North Korea released by North Korean state TV KRT on January 8, 2012. 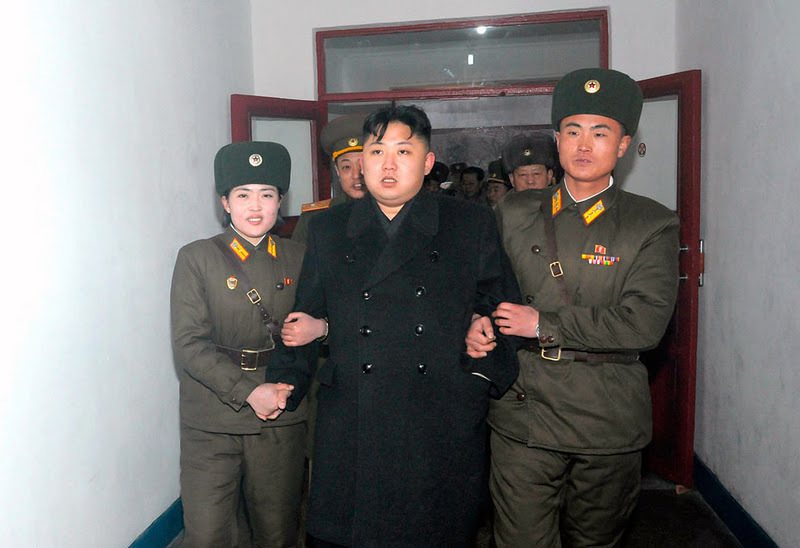 This picture taken by North Korea's official Korean Central News Agency shows North Korean leader Kim Jong Un greeting students during a visit to the Mangyongdae Revolutionary School on January 23, 2012. North Korea's new leader Kim Jong Un visits the Seoul Ryu Kyong Su 105 Guards Tank Division of the Korean People's Army (KPA) in Pyongyang, in this picture released by KCNA on January 1, 2012. 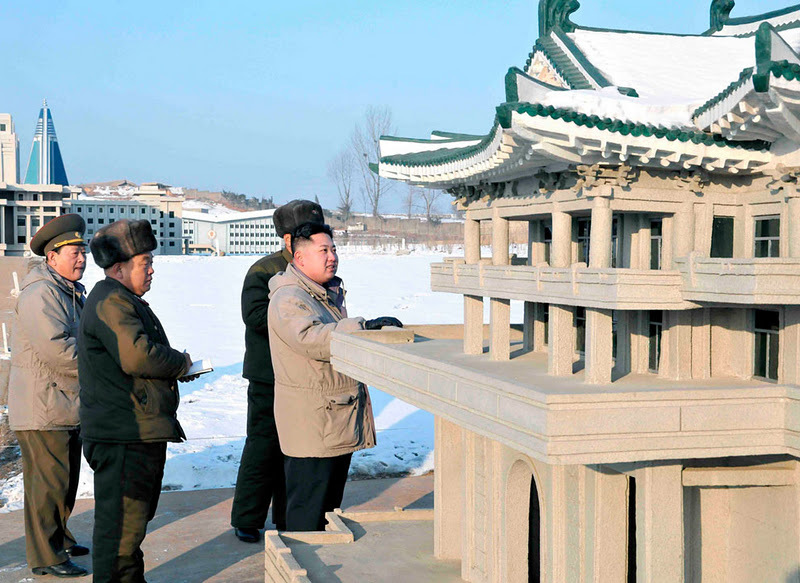 Kim Jong Un visits the Pyongyang Folk Park, which is under construction by KPA service personnel in Pyongyang, in this picture released by the North's KCNA early January 12, 2012. 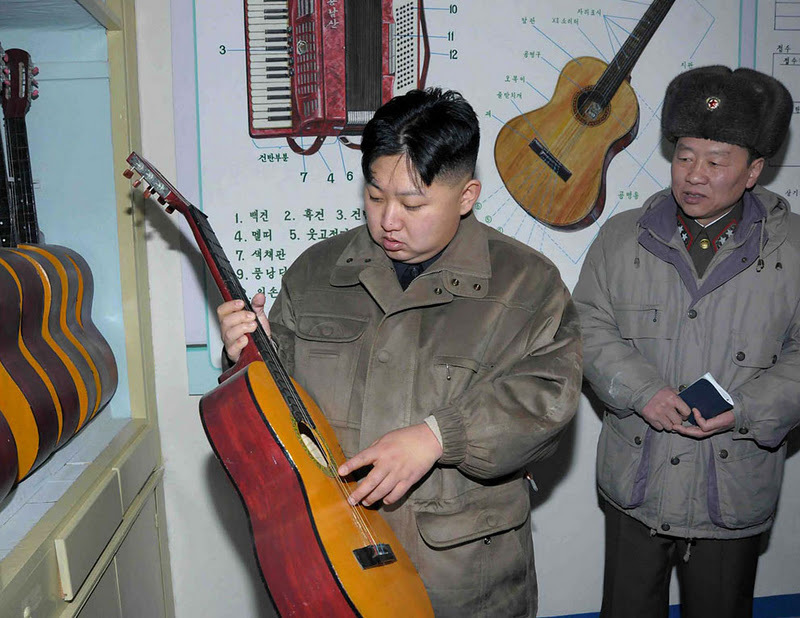 North Korean leader Kim Jong Un looks at a guitar at an undisclosed location in North Korea. 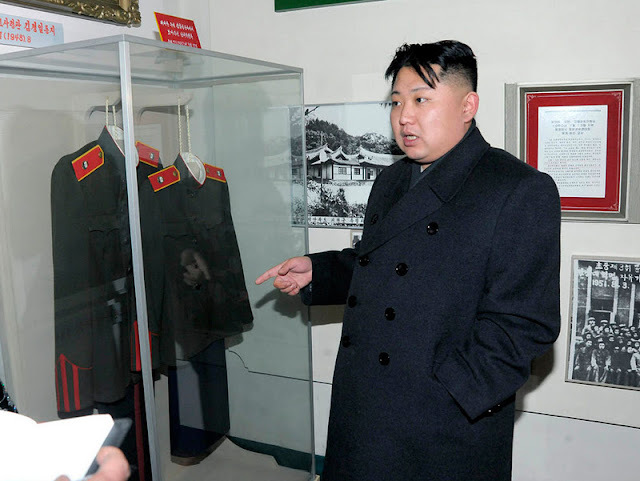 KCNA reported he was inspecting a military unit. 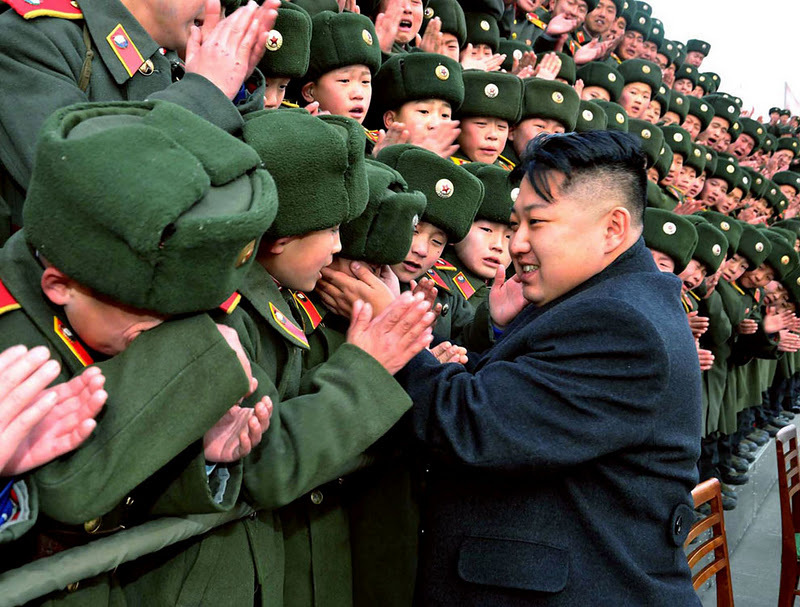 North Korea's new leader Kim Jong Un visits the Seoul Ryu Kyong Su 105 Guards Tank Division of the Korean People's Army (KPA) in Pyongyang, in this picture released on January 1, 2012. 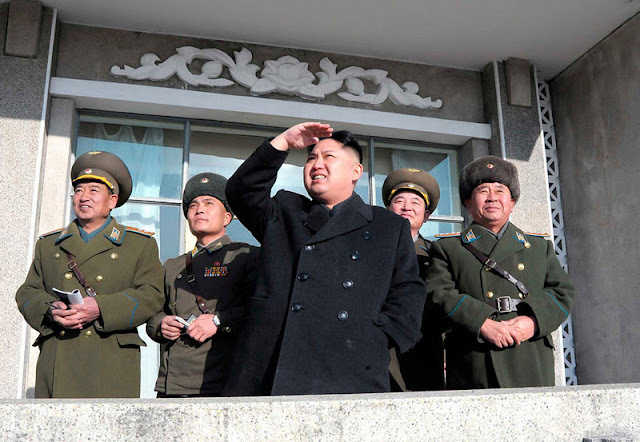 Kim Jong Un speaks during a trip to the Seoul Ryu Kyong Su 105 Guards Tank Division of the Korean People's Army (KPA) in Pyongyang, in this picture released on January 1, 2012. 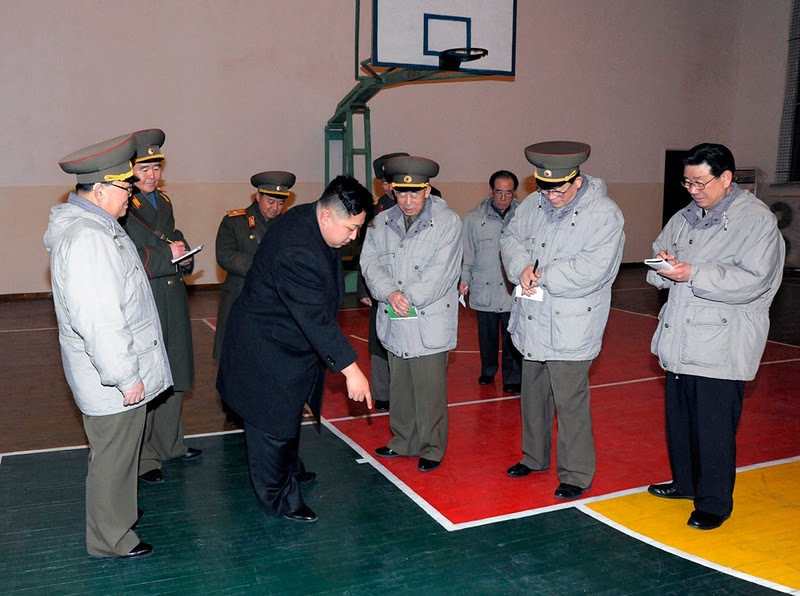 In this undated photo released by the Korean Central News Agency and distributed in Tokyo by the Korea News Service on Thursday, January 19, 2012, North Korean leader Kim Jong Un is reportedly inspecting a military unit at an undisclosed location in North Korea. 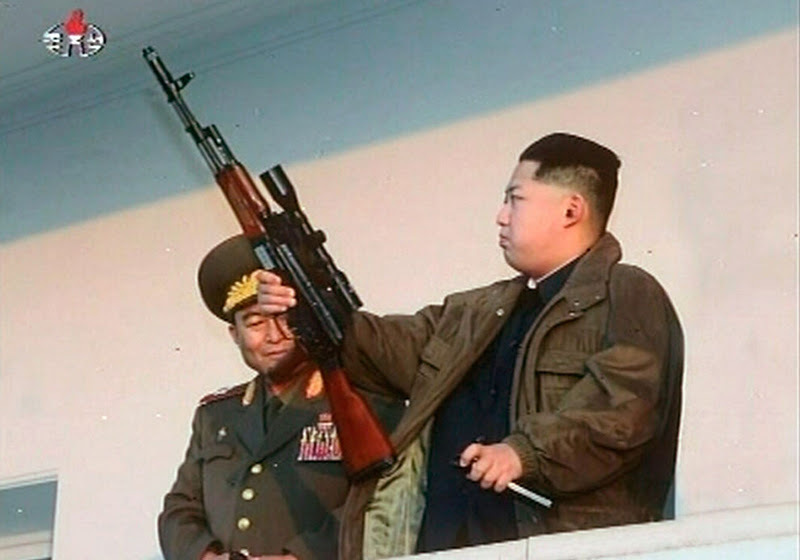 North Korean leader Kim Jong Un visits the Mangyongdae Revolutionary School in Pyongyang, in this undated picture released on January 25, 2012. 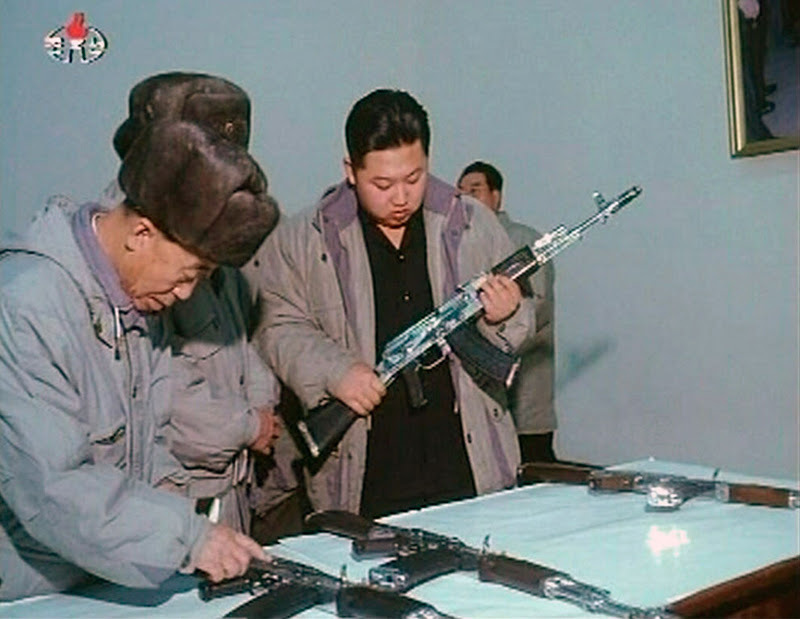 Kim Jong Un inspects weapons in this undated still image taken from video at an unknown location in North Korea released by North Korean state TV KRT on January 8, 2012. 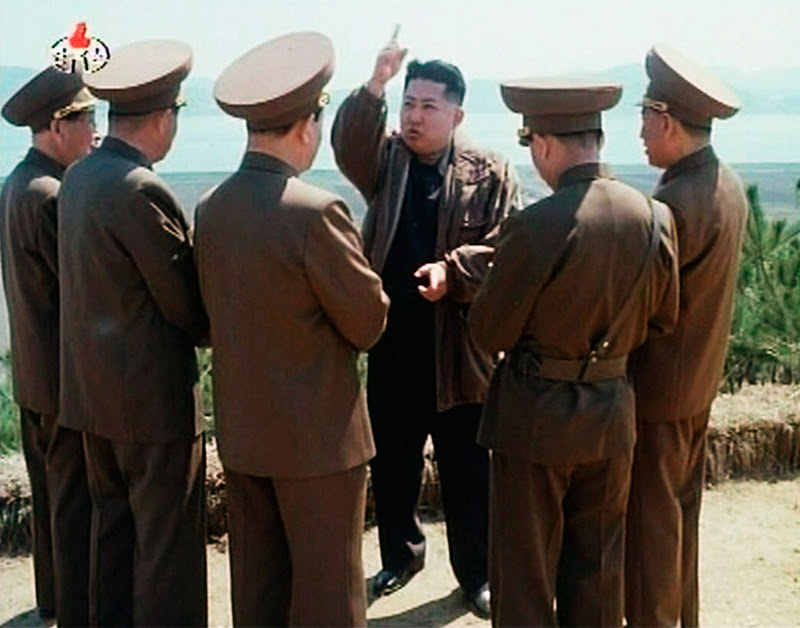 New leader of North Korea Kim Jong Un speaks while surrounded by soldiers in this undated still image taken from video at an unknown location in North Korea released on January 8, 2012. North Korean leader Kim Jong Un watches a demonstration by members of the Western Area Aviation Club in an undisclosed location in this undated picture released by the North's KCNA in Pyongyang, on January 28, 2012. 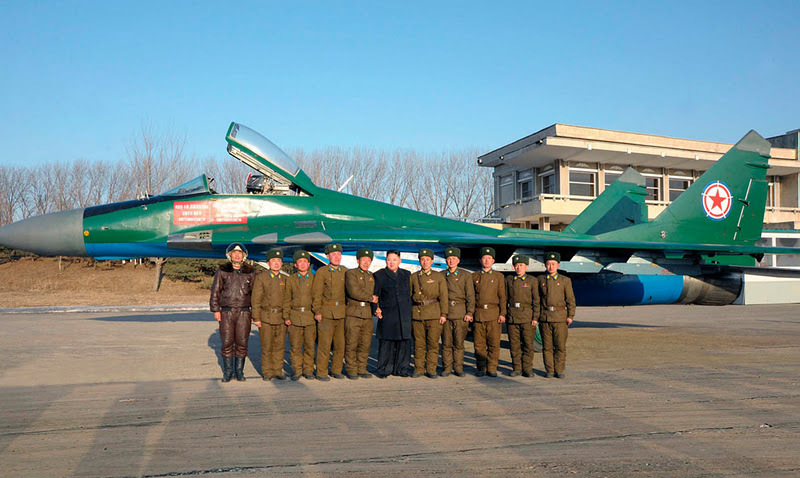 Posing with soldiers, Kim Jong Un visits Unit 1017 of the Korean People's Army Air Force in an undisclosed location in this undated picture released on January 31, 2012. 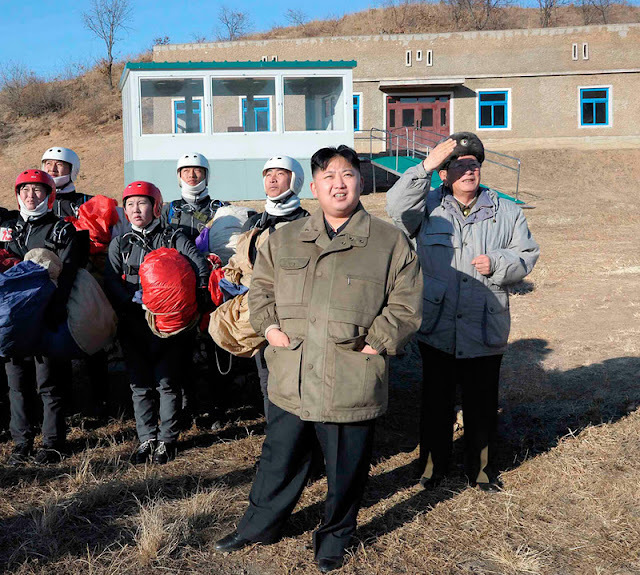 The leader of North Korea, Kim Jong Un, poses with members of the Western Area Aviation Club after watching a demonstration by them in an undisclosed location in this undated picture released on January 28, 2012. 0 responses to "Kim Jong Un Looking at Things"